← American Apparel Advertising is… Interesting. There is a meme out there that says there is no such thing as bad pizza. This is untrue – I have had bad pizza. 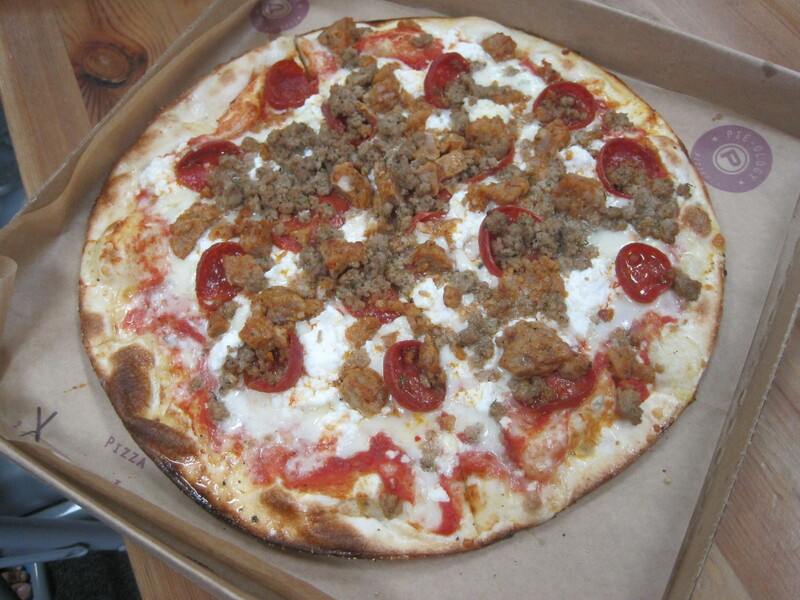 Pieology is not bad pizza. It isn’t spectacular pizza either, but it is custom made, and there is something to be said for that. It is also conveniently located in the same center as our favorite gaming store, where we can be found a couple of Sundays a month (at minimum). As such, we decided to give this place a go on a Sunday, while on our way to spending 4 hours saving the world from zombies. (or pretending to at least) The concept fits us pretty well – while the three of us can agree on our usual pepperoni and sausage combo, sometimes I like mushrooms, sometimes David likes ricotta cheese, and sometimes our little one likes a pizza Atkins would be proud of. 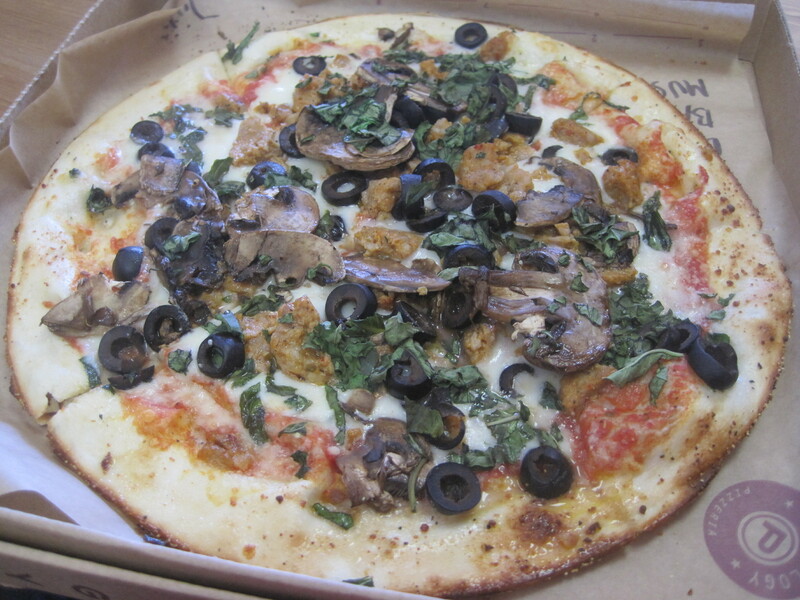 At Pieology, you buy individual pizzas which are offered at a flat rate, with all the toppings they can fit on the crust. The pizzas are assembled “Subway style”, so you get to see what you are picking, plus you can request a desired amount of any given ingredient from those available behind the counter. Meat, meat, and more meat. And some cheese. There isn’t the same level of options here you would find at a regular pizza parlor, but they’ve got all the basics covered, allowing you to assemble everything from plain pepperoni, to a Hawaiian style pie, to something with a Greek flavor to it. Plenty of choice for a quick hot lunch. Which is the next plus on my list – the pizza was cooked very quickly (likely a result of the very thin crust they use), and they were a good size for the price ($7.50 for a pizza the size of a large dinner plate). If you are a fan of thick crust, this isn’t going to work for you, but for us thin crust fans, this was perfect. So, if you happen to be in the Fullerton area (particularly if you are perhaps attending one of the colleges up there), I’d give them a try. It’s a nice break from that frozen cardboard from your local grocery store.